The drive down was uneventful. Seth got a little moody towards the end so Peppa Pig was to the rescue on my iPhone (we try really hard not to give him the iPhones, but sometimes needs must). When approaching Legoland, Adam decided to ignore Tom Tom’s directions as Legoland had lots of signs up and Tom Tom wanted us to go a different way. However, Legoland introduced a new route last year which avoids the town to keep traffic down. The new route takes you a really long way round, and put an extra 10 mins on the journey. This isn’t loads but I think we would follow Tom Tom next time we go, as it usually knows the best way. The carparks looked really full when we arrived, but it was just the first car park that they had filled. The rest were fairly empty. We never park in the first car park as it’s hard to get out of on the evening if you leave at closing time. First stop in the park was Starbucks which they have in the Hill Top Cafe which is near the entrance. 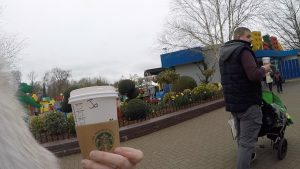 It is really brilliant as we get 20% off with our Merlin Annual Passes which is a great bonus and we love Starbucks. We had a slow and steady walk down to the Lego village as Reuben chose what we were doing first and they all love running round with the trains. I think we spent at least 30 mins doing this until we had a toilet break and then made our way down to Bricksville. Me and Elijah jumped on the Raft Racers on the way down as he’s tall enough now to do this and he really loved it. They are really fast slides with water but you are in a dingy boat thing. You do get a little splashed but nothing major. Adam tried insisting that he put the waterproof door on the GoPro, but I legged it as it takes too long. Bricksville is a play area with spongy floor and there is only two entrance/exits. There is normally always a member of staff by the one and the other is through the shop so we feel safe leaving them to run around freely as long as they know where we are sitting. Next to these is the Duplo airport, so Grace and Elijah took it in turns with me having a go on this. It is basically a helicopter that you sit in and you control it going up and down and round and round. The kids love being in control and there is never a queue to get on to these either. Right next to the shop is a little train ride which we can all go on, so we did. Seth thought it was fab, but it is a little bit babyish for the older two. 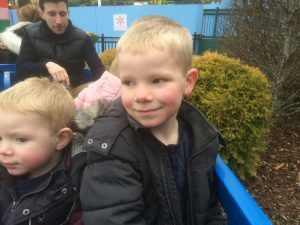 They still really enjoy the little rides as we all get to go on them together. I had made a packed lunch for this day and bought lots of snacks, so the tiddlies were munching away as we walked around. It turned out that it was a quite day so we were really lucky. 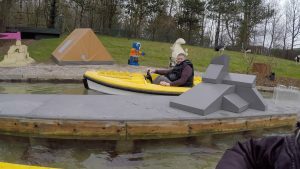 Next stop was the Coastguard HQ boats that you get to drive round a themed river with Lego animals on the side that squirt water at you. I had never been on this before, but Adam had. Whilst we were queuing we saw a dad manage to twist his boat side ways and get stuck which was super funny to watch and super embarrassing for him. Of course Adam made it his mission to make this happen to me. In true family style it turned into a race, but not a fair race. At every opportunity Adam tried to knock our boat and twist us in the wrong direction and I tried to win no matter what. At the end Adam twisted my boat in the wrong direction but I had managed to grab hold of his and spin it round as we corrected ours. He was shouting between laughing “let go of my boat”. I had managed to get back in the lead and leave him behind so me Grace and Elijah were the winners – yay. This was literally the funniest ride we have ever been on. After this was my favourite ride which is journey to Atlantis. It’s a fab pretend submarine that you go in and it makes believe that you have dived under the ocean to find lots of different fish and collect data. The bottom of the sub that you sit in is glass so you get to see some lovely fish, sharks and sting rays. It really is a lovely ride and all of us can go on so another bonus with little ones. We stopped for lunch and ate at some picnic benches which were only for restaurant customers only. The food outlet was closed so we didn’t think they would mind, and there isn’t many other places to eat picnics. This is when the rain came. It was only spitting a little so no big deal. We finished up and were on our way. 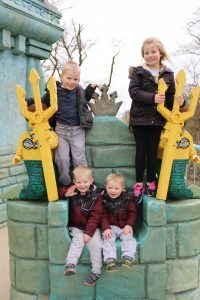 We stood by Squid Surfer for ages as they have buttons that you can push which sets off water cannons to get the people on the ride really wet. My lovely children stood and did this for ages, but if you’re not careful you can get really wet yourself as the water comes over the path really far. We made it to Heartlake City which is the newest area in Legoland. 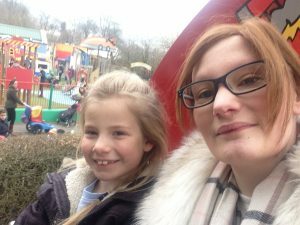 It was new last year and is a great area but the only ride, Mias Riding Adventure, is a 1.2 metres ride so only Grace can go on it. This is a shame for the boys, but they do have loads of lego for them to play with while we waited and this does keep them entertained. Adam took Grace on and they both really enjoyed it. They didn’t really wait very long at all. The rain had got quite heavy so we all had a toilet break and made our way to the shop. Inside they have an interactive house (Olivia’s House) where they can make cakes on a computer type screen that looks like a cooker. They also have a huge lego display with iPads dotted around where you can use them to zoom in a little and have a look around. There is also a living room and a bedroom all made of Lego of course. The weather wasn’t terrible but still not dry so we made our way to Scarab Bouncers which is inside so we got to stay dry for a little longer. Only Seth can’t go on this but he had fell asleep in the pushchair so he didn’t care. 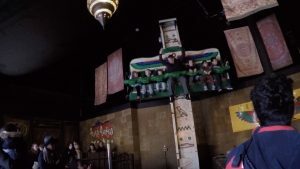 On this ride you sit in a row and it takes you up to the top which is fairly high and then bounces you back down. The kids love it, and I think Adam secretly does too. It is so funny on this ride as Adam always seems to adopt a child. Every time he has taken our children on another child always wants to sit by him and this time was no different. There are two of these rides and a girl that was about 10 maybe was put on the other one. She got up before the bars went down and made her way over to sit with Adam. The ride operator moved her back to the other one to balance it out I’m guessing. She was nearly crying so the member off staff had to allow her to move back next to Adam. Very strange yet rather funny. On we went to the Spinning Spider. Adam took Grace Reuben and Elijah on. It took them ages to start the ride as they had a few people that were being difficult and then some work men turned up to check the fire extinguisher in the hut. I went off for a stroll with Seth around the Burger Kitchen which was super quite. Reuben wanted to go on Jolly Rocker (a Pirate Ship). Adam took Grace and Reuben as Elijah isn’t tall enough. I expected a melt down but Elijah handled it really well and watched and waved like a mad child. This was going to be the last ride and we were meant to be making our way up to Star Wars. 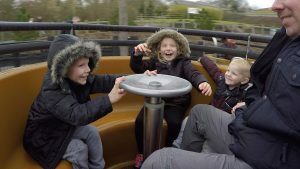 However, Grace and Reuben really wanted to do Knights Quest which is a train that just goes round in circles – really fast. The kids love this but the man running it was really struggling, I think. He left the exit gate open and children were running in and seating themselves and I’m sure they weren’t tall enough. He then went to start the ride with it still open which could have been fatal if a child had run in while the ride was running. Adam had to shout him to remind him to close it and he said “thanks mate, I would of got sacked for that”. With moans from the children, we started to make our way up the huge hill towards Star Wars – it is a big hill. They really were not happy at all and we hate leaving on a down note so we stopped off at Longboat Invader which is a Viking boat that goes backwards forwards and spins. This seemed to appease the tiddlies and we trotted off up the rest of the hill. Star Wars is a walk through attraction and it basically has lots of scenes from Star Wars made from Lego. Some of them are interactive so you get to press buttons and the lights flash or the figures move. 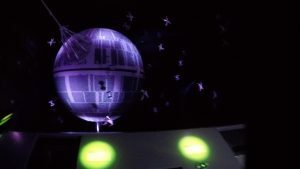 This year they have added the Death Star which is huge – like as big as a small car. They also have a time-lapse video of them building it. Even if you don’t like Lego or Star Wars, I think everyone would be able to appreciate how amazing this is. It really was the end of the day, so we made our way to the Hill Top Cafe and purchased another Starbucks and some cookies and crisps for the journey home. 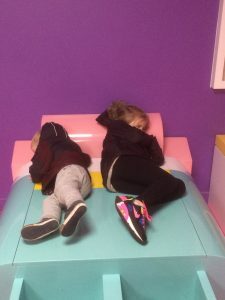 This was a long day but we really did have a fab time and the fact it was quiet was a huge bonus and made the day. Thank you for reading, hope you enjoy any trips to Legoland that you may have planned.